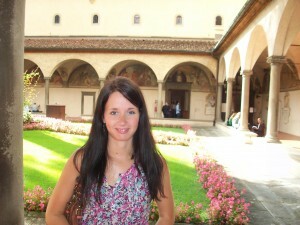 Dr Jenny Hillman is Max Weber Postdoctoral Fellow in History at the European University Institute, Florence. Here she reviews Susan Karant-Nunn’s book The Reformation of Feeling: Shaping the Religious Emotions in Early Modern Germany (Oxford University Press, 2010), recently released in paperback, for the QMUL History of Emotions Blog. Good Friday continues to elicit powerful emotions among the faithful. In April 2012, the Telegraph reported that 12 Catholics in the Pampanga province of the Philippines had voluntarily been nailed to the cross in a graphic re-enactment of the Passion of Christ, which was later condemned by the Church. Less extreme was my own first-hand encounter with ‘religious emotions’ during a Good Friday mass at a Lancastrian Catholic Church during the early 1990s, when (as a small child) I was surprised to witness a number of female parishioners weep as they each genuflected and kissed the foot of the cross. 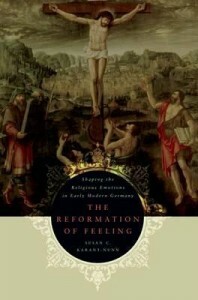 In her recent book, The Reformation of Feeling, Susan Karant-Nunn allows us to glimpse similarly unfamiliar sentiments in the context of early modern Germany, largely through an interrogation of Passion sermons. Karant-Nunn explains her decision to focus on ‘two core subgenres’ of printed sermons: those treating death and those expounding Christ’s Passion. Holy Week and the Death Bed were both settings which she correctly judges to be particularly emotionally-charged. Judiciously selected quotations from this material colour the eight main chapters. Careful analyses of several passages are provided and the discussion remains faithful to the language of emotion employed by the preachers throughout. Karant-Nunn detects the recurrence of Trost (or reassurance) in the Lutheran sermons, for example, and shows that whilst Lutheran preachers sought to inspire sorrow for sin and a love of God, their overwhelming message was to instil comfort through this vocabulary (pp. 97, 251). Elsewhere these rich sources are, quite appropriately, left to speak for themselves. Sermons delivered by Catholic, Lutheran and Reformed (Calvinist) preachers to mass audiences were, according to this comparative study, designed to stimulate certain kinds of religious emotions which supported competing confessional claims during the Reformation. In other words, rhetorical appeals to the emotions reinforced the broader processes of religious renewal in each of these traditions. The correspondence between the emotionality of sermons and the Reformation agendas of the three respective confessional groups is presented in the first three chapters. Chapter One ‘The Emotions in Early Modern Catholicism,’ shows that preachers urged their audiences to feel an emotional identification with Christ, through regular contemplation of his suffering. These exhortations often took the form of quite graphic descriptions of Christ’s corporeality and his agonized flesh. In Mainz, for example, the Franciscan Johannes Wild described the horror of Christ ‘sweating blood’ and tried to impress Christ’s wounds upon the memories of his congregation (p. 28). Chapter Two ’The Lutheran Churches’ details the Lutheran ‘curtailment’ (p. 64) of this emotionality, through a toned-down treatment of the Passion. This relative restraint also manifested itself in the purging of sacred spaces, particularly those adornments which were most emblematic of femininity. As Karan-Nunn notes, ‘this signalled to the pious that the best religiosity was calm, interior and unrelated to material objects’ (p. 68). Chapter Three ‘The Reformed Churches’ reveals that Calvin and his reformers departed ‘drastically’ from both Catholics and Lutherans, in a psychological rendering of Christ’s Passion (p. 101), since for them, bodies (including Christ’s) ‘could not serve as a nexus between the telluric and the heavenly’ (p. 103). Instead, preachers in the Reformed tradition condemned and shamed the sinfulness of their congregations and inculcated feelings of worthlessness and sorrow. Evidently, ‘these were not sermons of good cheer’ (p. 114). The book thus highlights both continuities and change across the period. It argues for a ‘new-old’ Catholic tradition (p. 60), in which sixteenth and seventeenth-century preachers appropriated strands of medieval piety, making expressive and emotive demonstrations of faith characteristic, or ‘affective earmarks’ of post-Tridentine Catholicism (p. 62). It also posits that neither Lutheranism nor Calvinism ‘…invented ideals of religious feeling that had not existed earlier’ (p. 11), but it does show that the Reformed programme consisted of attempts to ‘dampen the outer demonstrations of religious fervour’ encouraged by the Catholics (p. 63). Interestingly, Chapter Four is devoted to ‘The Condemnation of the Jews.’ The ways in which this theme cut across the sermons of all three traditions, with the shared aim of stimulating feelings of ‘revulsion and hostility’ is successfully illustrated (p. 157). However, I was unconvinced by the categorisation of anti-Semitic feelings as a ‘religious emotion’ – something which Karant-Nunn is herself hesitant about (p. 133) – and thus it seemed to sit less comfortably with the other chapters. The connection between femininity and emotionality is a recurring theme throughout the text, but one which is probed most deeply in Chapter Five ‘The Mother Stood at the Foot of the Cross.’ The chapter finds (quite predictably) that both Lutheran and Reformed preachers attributed a less significant role to the Mother of Jesus in their Passion sermons than their Catholic counterparts (p. 159), and Lutheranism and Calvinism are, consequently, deemed to be ‘more masculine’ (p. 186). In this regard, the chapter does not really contribute anything new. But, importantly, it does offer some more broadly useful reflections on female emotionality as a historical and cultural stereotype, by challenging the assumption that it was necessarily a weakness. As Karant-Nunn reminds us, for the Catholics, Mary was ‘an incentive and a model to feel strongly’ (p. 169) and her emotionality a virtue. There is some attention to the textual clues about the oral techniques used by those ministering, which underlines the rhythms, accents and tones of the homiletics. Reformed preacher Caspar Olevianus used verbal repetition and the ‘resounding enunciation’ of ‘hellish’ seven times in four sentences as a ‘rhetorical technique (anaphora)’ to harrow his sixteenth-century audience with the psychological horror of Christ’s Passion (pp. 120 – 21). It strikes me that the use of these cues to gauge the emotional investment of early modern preachers might be an important area of future research in the field. 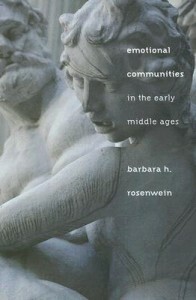 Karant-Nunn acknowledges her debts to Barbara Rosenwein’s concept of the ‘emotional community’ (p. 4), in her exploration of collective emotional experiences and emotional cultures. It is observed in Chapter Seven ‘The Formation of Religious Sensibilities’ that sermons were vehicles for communicating reformation messages to large audiences and that their reception was a communal, and often social, experience (p. 218). Karant-Nunn also shows that certain religious emotions such as sympathy with Christ’s bodily sufferings were intended to be aspired to collectively, where preachers and people bonded through ‘feeling together’ (p. 61). Unity through grief was also the theme of Chapter Six ‘Proper Feelings in and around the Death Bed’ (p. 192). Perhaps this could have been more fully explored in the sections on material culture in Churches, where the ‘collective performance of emotion’ (as John Corrigan put it) would have surely been most pronounced. The Reformation of Feeling is among the first historical studies of the emotional dimension to the Reformation written in English and should help to set the bar for future research in the history of the ‘religious emotions.’ Susan Karant-Nunn illuminates very effectively the way the polemical recourse to emotional ‘scripts’ (p. 255) was intended to inspire faith in the early modern age of religious renewal. On 17 October 2012, speaking in Saint Peter’s Square, Pope Benedict XVI implored Catholics around the world to renew their faith not only through catechism, but through ‘feelings’, ‘heart’ and emotions.’ The Annus Fidei will, no doubt, bring many more attempts to engage emotions from the pulpit. This entry was posted in Book Reviews and tagged Annus Fidei, Calvinist, Catholic, Good Friday, Lutheran, passion, Pope Benedict XVI, Reformation of Feeling, religion, sermons, Susan Karant-Nunn by Jennifer Hillman. Bookmark the permalink.